Step 1 Heat the oven to 425 degrees. Rinse the cavity of the duck well under cold running water until the water runs clear. Set aside all giblets but the liver (discard the liver) for making stock. Pat the duck dry and rub about 1 tablespoon of the olive oil on the outside of the duck. Season with salt. Step 2 In a roasting pan, toss the carrots, onion, celery and thyme with the remaining 1 tablespoon olive oil. Place the duck on top of the vegetables; roast for 15 minutes. Reduce the oven temperature to 350 degrees and continue to roast an additional 1 hour to 1 hour, 20 minutes until a thermometer inserted in the thigh reaches 145 degrees. (The meat will be pink.) Remove the duck from the oven and let stand until cool enough to handle. In Recipes-list.com we have selected the most viewed recipes from category - Main courses . Enjoy the best recipes specially selected for you! 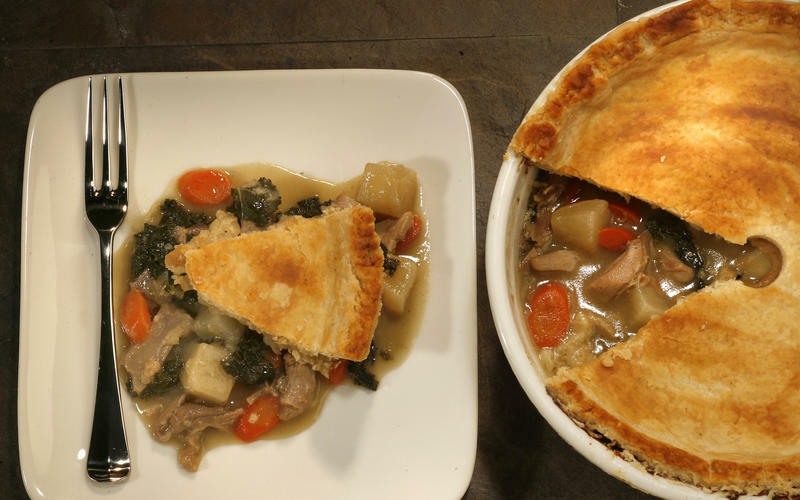 Roasted duck pot pie is the right choice that will satisfy all your claims.